Preschoolers are like little raccoons. 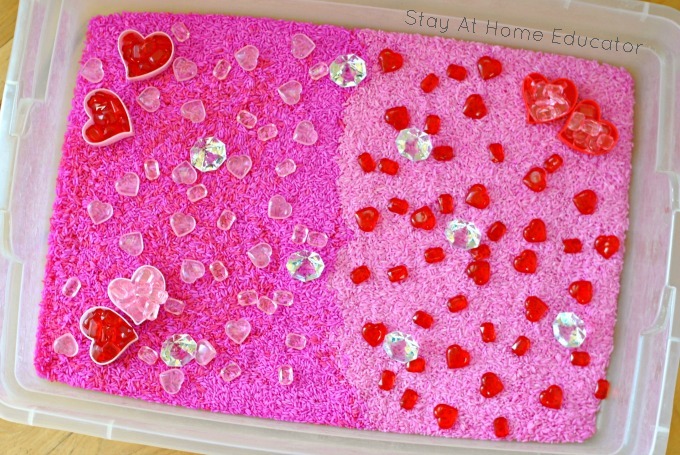 They love all things sparkly, which is just one reason why this Valentine’s sensory bin was such a huge hit! With practically neon pink rice and handfuls of light pink and red gems (and a few giant diamonds), what’s not to like? I have this problem when I go to Hobby Lobby. 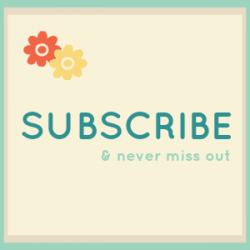 Do you have a Hobby Lobby near you? You’re lucky if you don’t. That’s right…if you don’t. Because otherwise you might have this problem, too. The problem is this: I want everything! I mean, talk about a great place for creative inspiration! A good blogging friend of mine said that strolling the aisles of Hobby Lobby (by herself, I might add), is one of her favorite ways to relax. a problem that needs a solution. Um, having trouble keeping track of everyone’s snow hats and gloves and such? Keep them in an over-the-door shoe rack . Try it. You’ll thank me later. or by something lovely staring you in the face. This is what happens when you spend an evening by yourself at a place like Hobby Lobby. Because when I happened upon the aisle with all their seasonal decorations (ok, I know, it’s right inside the door; it didn’t happen very accidentally at all), you stop and look. And admire. And dream. And the next thing you know you’ve loaded up your basket with a baggy or two each of acrylic hearts in pink and red, and acrylic gems in pink and red, and eight or more giant diamonds. 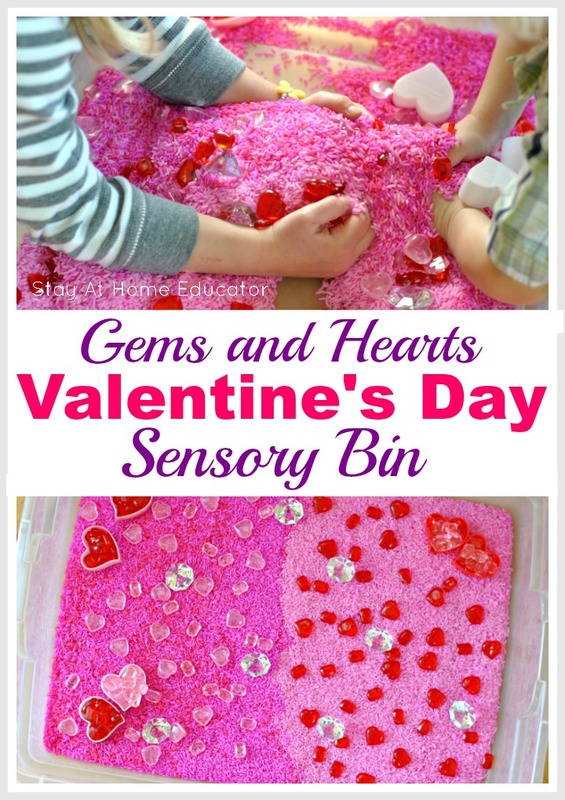 But honestly, that’s all ok because you end up with an awesome Valentine’s sensory bin! And when you teach a handful of preschoolers who are like little raccoons and drawn to shiny things, a trip to Hobby Lobby that results in such is a great thing. My preschoolers’ eyes nearly popped out of their happy little heads when they saw this sensory bin! Yes, it definitely has a girls’ appeal, but the boys liked it too! Sensory bins tend to make noise, which boys like. And this sensory bin had gigantic diamond shaped gems in it, which the boys liked to collect for treasures. I think I have Valentine pirates in my class. 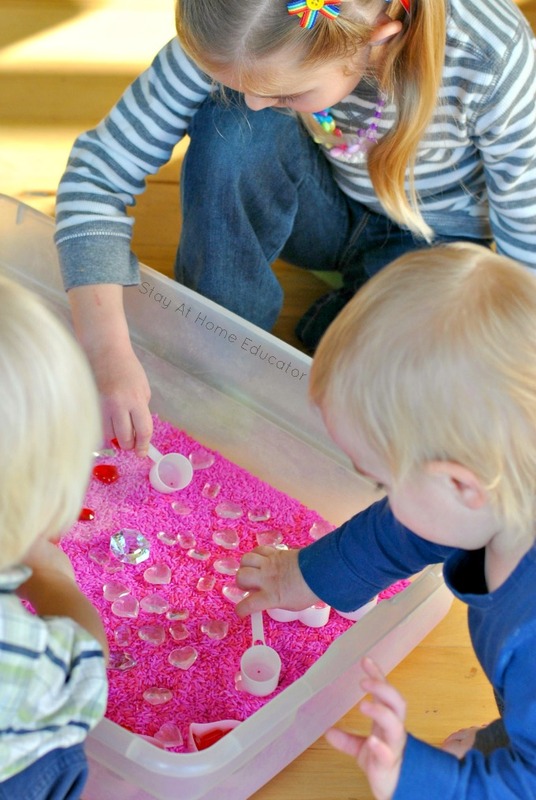 My point is, this is a super fun Valentine’s sensory bin, for both boys and girls! acrylic hearts (Here they are in red , pink , clear and even in rainbow colors ). acrylic gems (I have pink and red , but you can also get a rainbow of colors ). heart shaped bins with lids (I grabbed mine from a dollar store). Start by dying your rice . I used Colorations brand liquid watercolor . They are my favorite because they have so many different colors and they are so incredibly vibrant! Carefully pour the dyed rice into the bin in stripes of color. Then gently add the gems and heart shaped bins. 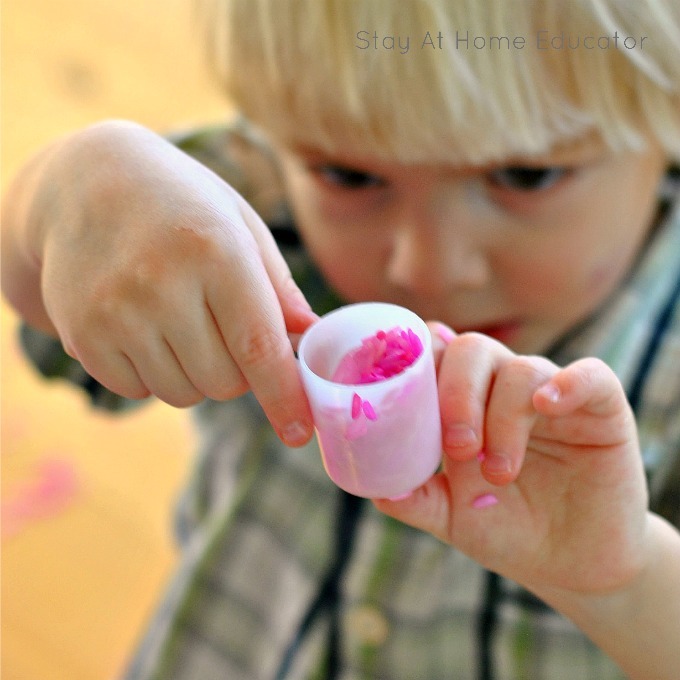 Now invite your kiddos to come and have some Valentine’s sensory fun! At first, the kids marveled at the sparkly gems and hearts. My daughter began counting them, as if counting loot after a great haul. I offered them some formula scoops to use in the bin. (Formula scoops make the best, scoops, by the way). They were just the right size to scoop the rice and gather up the smaller hearts and gems. My daughter made quick work of collecting all the hearts, laying them out on the floor in long lines that stretched the length of the sensory bin. At first she just made lines, but another preschooler sat next to her and tried to make patterns with the hearts. 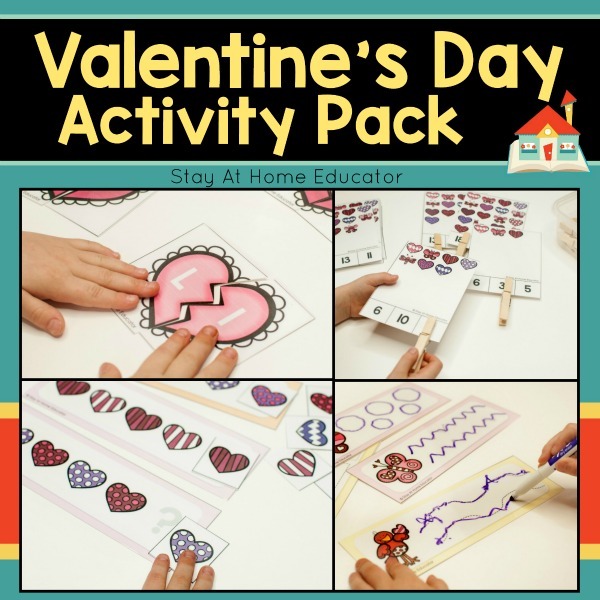 Want Some Printable Valentine’s activities? After several minutes they returned to the bin and collected hearts in the little heart containers. The girls counted how many hearts could fit in the containers. So far, the work has been very delicate. My preschoolers jabbered away at how pretty everything was, holding the large acrylic diamonds up in the air to look through them. My son filled formula scoops full of rice and held them up to closely examine them, looking for any gems that might be hidden in his scoop. “Treasure!” she called out and used her hands and arms to scoop up as much of the sensory bin as possible, mixing all the gems and colors of rice together. And then the others got involved, brushing the rice from side to side as if their hands were little brooms . They used the scoops to bury the gems in the rice and then it was a race to see who found them again! You might be asking yourself the point of this sensory bin. 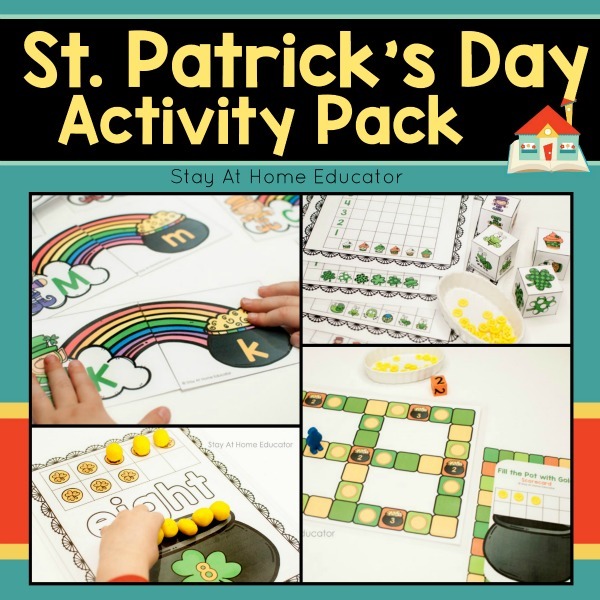 Yes, it’s in warm Valentine’s colors (and pairs wonderfully with any Valentine’s theme in preschool) but beyond that, what is the point? Here is a short list of the “why” behind a sensory bin. Sensory bins give children opportunities to practice fine motor work, like scooping and pouring, which are life skills. Sensory bins develop language skills as children learn about the contents of the bin. Sensory bins encourage children to take turns and share. Sensory bins stimulate multiple senses at once. 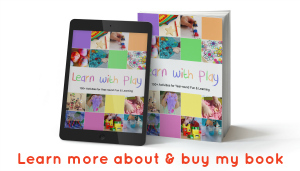 Sensory bins allow children to explore and learn through play, which is how they learn best. 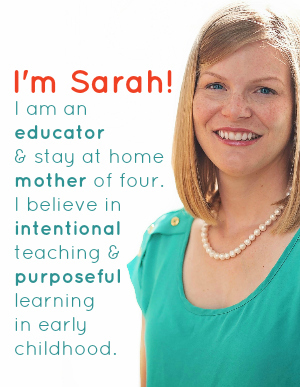 And preschoolers like fun. They learn really well when something is fun. So, I’ll keep making sensory bins, even if it means more trips to Hobby Lobby.